“It is said that an Asian man decided to divorce his wife and send her back to her parents’ house. Before telling her his decision, the man wanted to take a walk around the lake, to gather his thoughts. Mandarin Ducks are thought to be one of the most special water birds in the world. Asians refer to them as the YIN/YANG ducks. Mandarins symbolize love, romance, devotion, affection and fidelity, and they are often used to aide single people. Helping them find – MAGNETIZE- the great love of their life. The best placement for a pair of Mandarin ducks, whether single or married, is in the PARTNERSHIP GUA of your BEDROOM or HOME. In Asian tradition, pink quartz ties destinies, bonds love, and has the capacity to help you make peace with someone after a fight. 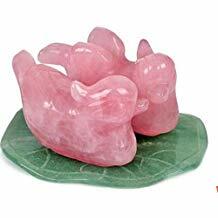 However, if PINK DUCKS are not your cup of tea, placing two rose quartz hearts in the Partnership gua of your bedroom or home – will accomplish the same thing. ← MORE News on 2019..!